The expanding national highway system brought I-75 through Independence Township in 1962, spurring both business and residential development. Many farms gave way to subdivisions and strip malls as Independence Township continued evolving into part of Metropolitan Detroit. Independence Township is primarily serviced by the Clarkston Community Schools. In 2016, Clarkston High School had an enrollment of 1,930 students in grade nine through twelve. The school is located at 6093 Flemings Lake Road in Independence Township. Clarkston High School offers twenty-six varsity sports, and competes in the Oakland Activities Association. It is a member of the Michigan High School Athletic Association. Renaissance High School is located at 6558 Waldon Road in Independence Township. Renaissance High School is for students in grades 9 to 12 who need an alternative to the traditional high school setting in order to be successful. Renaissance students must meet Clarkston High School graduation requirements and receive a Clarkston High School diploma. Renaissance students are encouraged to participate in athletics, clubs and extracurricular activities offered at Clarkston High School. Renaissance students can also take courses at the Oakland Schools Campus, whose Northwest campus is also located in the township at 8211 Big Lake Road. Opened in 2008, Everest Collegiate High School is a private Roman Catholic high school also located in the township at 5935 Clarkston Road in Independence Township. The school competes athletically in the Catholic High School League and is a member of the Michigan High School Athletic Association. Clarkston Junior High School is located at 6595 Waldon Road in Clarkston. The school teaches eight and ninth grades. Sashabaw Middle School is located at 5565 Pine Knob Lane in Independence Township. The school teaches sixth and seventh grades. Everest Academy, a private Catholic elementary school, is also located in Independence Township. Independence Township is home to three public golf courses; Fountains Golf Golf Club, an 18-hole course located at 6060 Maybee Road in Independence Township, Pine Knob Golf Club, a 27-hole course, located at 5580 Waldon Road in Independence Township, and Shepherd's Hollow Golf Club, a 27- hole championship course rated 42nd best golf course in the United States by Golf Magazine. It is located at 9085 Big Lake Road in Independence Township. Pine Knob is a ski resort located in Independence Township. It features 17 trails and 12 lifts. It is known for its slope called "The Wall". Pine Knob is also home to the DTE Energy Music Theatre, an outdoor Amphitheater concert venue that has featured hundreds of celebrities and is always one of the highest grossing outdoor amphitheaters in the United States. It is located in Independence Township minutes away from downtown Clarkston. The concert venue, which opened in 1972, was originally called Pine Knob Music Theater until DTE Energy purchased its naming rights in 2001. 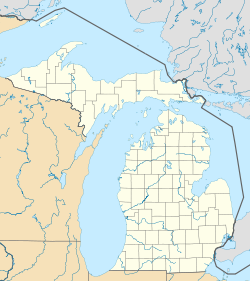 Independence Township is located along the Hillsdale-Lapeer Moraine Range. The highest hill along that range in Independence Township is Pine Knob, at 1,221 feet. It is also the highest point in Southeastern Michigan. Only three miles away is Waterford Hill, the second highest hill in Independence Township with an elevation of 1,150 feet. Atop Waterford Hill is Olympus Circle, the highest elevation of any residential street in Independence Township. The Clinton River winds its way through Independence Township creating more than thirty named lakes of all sizes along the way. According to the United States Census Bureau, the township has a total area of 36.3 square miles (94 km2), of which 35.2 square miles (91 km2) is land and 1.1 square miles (2.8 km2), or 3.03%, is water. The population of Independence Township was 34,681 at the 2010 census. Henry Ford, industrialist and founder of the Ford Motor Company. Maintained a summer home and weekend cottage on Main Street. Ford also owned a mill which operated on the water from what is now called "Mill Pond" in Clarkston. This building still exists in part but has been modernized into a small mall which includes art galleries and office space. He also purchased the old school building on N. Main St. to serve as an apprentice school. ^ "Village of Clarkston, MI - Official Website". www.villageofclarkston.org. ^ "2019 Largest Public High Schools in Michigan". Niche. ^ "Oakland Activities Association". www.oaklandactivitiesassoc.org. ^ a b "Michigan High School Athletic Association". www.mhsaa.com. ^ "Catholic High School League - The Official Website for the Catholic High School League". www.chsl.com. ^ "Golf Course - Banquet Facility - Golf Club - Clarkston". ^ "Shepherd's Hollow Golf Club". Shepherd's Hollow Golf Club. ^ "Find Golf Courses Near Me". Golflink.com. Retrieved August 22, 2018. ^ ClubCorp. "Oakhurst Golf & Country Club". Oakhurst Golf & Country Club. ^ "Michigan Amateur gears for 99th annual golf championship". ^ "Clarkston Topo Map, Oakland County MI (Clarkston Area)". ^ "Waterford Hill Topo Map, Oakland County MI (Clarkston Area)". ^ Foster, Dan. "Map and Download 7148 Lakes in Michigan to your GPS - Maps of all 7148 Lakes in Michigan (topo maps, street maps, aerial photos)". www.expertgps.com. ^ "Oakland County MI Lakes - LakePlace.com". www.lakeplace.com. ^ "Race, Hispanic or Latino, Age, and Housing Occupancy: 2010 Census Redistricting Data (Public Law 94-171) Summary File (QT-PL), Independence charter township, Oakland County, Michigan". U.S. Census Bureau, American FactFinder 2. Archived from the original on September 11, 2013. Retrieved August 22, 2011. ^ "Valerie Bertinelli". International Speakers Bureau. Archived from the original on November 28, 2012. Retrieved November 23, 2012. ^ "Henry Ford in the Village of Clarkston – Michigan History". michiganhistory.leadr.msu.edu. ^ "Village Of Clarkston Historic District". www.clarkstonhistory.info. This page was last edited on 27 January 2019, at 09:40 (UTC).